Find out how to keep your teeth looking and feeling their best after teeth whitening. This involves brushing a minimum of twice a day and flossing daily. After all, the only way to keep teeth looking their best is to provide them with as thorough an at-home cleaning as possible. To keep your smile looking its best you may choose to brush with whitening toothpaste. Just don’t forget to brush your tongue too, as bacteria can build up on the tongue and spread to your teeth and cause stains. When you brush you should be spending a minimum of two minutes each time brushing your teeth. Floss once a day, preferably before bedtime. If you have to enjoy that morning cup of coffee it’s recommended that you drink chilled and through a straw, as this can limit how much contact your teeth have with the dark liquid. Even with the best at-home dental care in place, you will still need to visit your Huntersville dentist every six months for professional cleanings and to make sure that your teeth and gums are healthy. During these cleanings we can remove minor surface stains that have built up over the last six months, allowing you to keep those whitening results for longer. You may also choose to use some whitening products from the comfort of your own home. Talk to your dentist about professional at-home whitening for keeping your results fresh or turn to over-the-counter methods as a way to prevent stains from forming. If you are interested in getting professional teeth whitening in Huntersville, NC, then call our dental office today to find out if you are an ideal candidate for this cosmetic treatment. Get started on a brighter smile by calling (704) 948-1300! 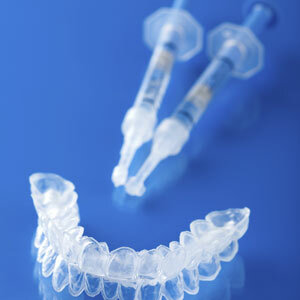 Find out how professional teeth whitening works. There are many people who can benefit from getting teeth whitening from our Huntersville, NC, cosmetic dentist Dr. JC Duncan. No matter whether you’re not getting the results you want from whitening toothpastes or you really want to “wow” everyone with a more vibrant smile, it’s time to find out how professional teeth whitening can do just that. Professional teeth whitening works a bit differently from over-the-counter methods, which makes it more effective and reliable for removing surface stains and for giving you an all-over whiter smile. The first difference is the bleaching gel. Now, any bleaching gel will contain either hydrogen peroxide or carbamide peroxide. These active ingredients work to breakup stain molecules on the surface of your teeth. Of course, the percentage of the active ingredient is very small in over-the-counter whitening products, which means that you will have to leave the whitening gel on your teeth for a longer period of time to see results. The whitening gel that our Huntersville, NC, dentist uses, on the other hand, has a much higher concentration of the peroxide, which means that we only need to apply it and leave the gel on for 10-15 minutes at a time throughout your one-hour whitening treatment to get the results you want. After just one whitening session, many patients’ smiles were up to five shades whiter, and many of them got exactly the results they wanted in one in-office whitening treatment. We also understand that in-office whitening might not be in the budget. Or perhaps you prefer to have full control over the whitening process. Whatever the case might be, you can save money and still get a whiter smile by turning to our at-home whitening treatment. With custom-fitted whitening trays and effective whitening gel, you could get the results you want in as a little as one week. If you are ready to feel confident in your smile once more than it’s time to turn to the cosmetic dentistry experts here at Huntersville, NC. Call our office today to schedule a consultation. A brighter smile can be yours!